I am Cochiti. I am Ohkay Owingeh. I am a daughter. I am a sister, I am a granddaughter. I am a community member. I am defined by my duties to those around me such as my beautiful family and my entire community who influence my daily life and have shaped the vision and goals I have for myself. I was born, raised, and currently reside in Cochiti Pueblo, New Mexico. My family and I are active participants in our community life that is based on a cultural calendar that runs throughout the year. As a member of the Cochiti and Ohkay Owingeh community, I am obligated to contribute to the protection and participate in the perpetuation of both our Pueblo life ways and of our language. Hello my name is Destiny Montoya, I am seventeen years old and a senior at the Santa Fe Indian School. I was attracted to the internship with TYCC (Tribal Youth Conservation Corps) with Cochiti Pueblo (program paid by U.S. Fish and Wildlife Service) because we would learn a lot about wildlife, fish, water quality, and being outdoors. This field is not always being stuck in a office but always outdoors doing something more productive with yourself and making the environment a better place. 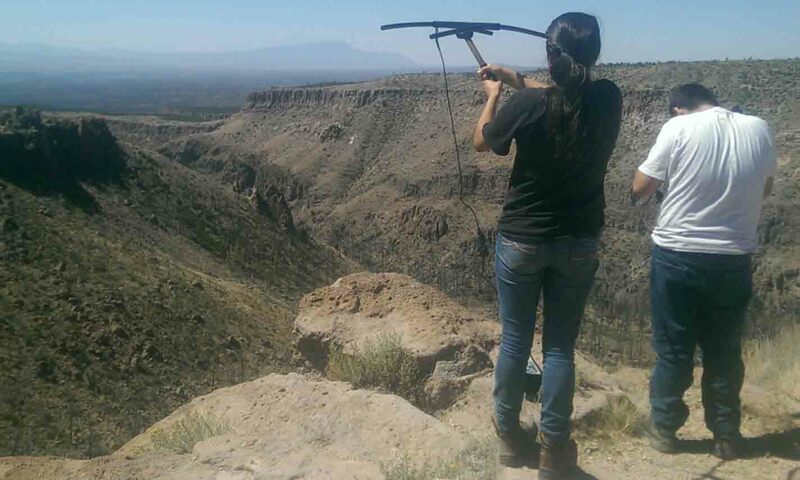 Through this program I’ve learned the point of view of the environment such as water quality monitoring, radio telemetry tracking of big horn sheep, fish shocking to remove non-native fish, building stream restoration structures, and measuring canopy coverage. I learned this by working with Rich Schrader, Carlos Herrera, Cochiti Pueblo DNRC and US Fish and Wildlife Service. My internship was very educational and fun for me and my fellow interns who are interested in the environmental field. Water is very important to all life, so I’m grateful to learn how water quality sustains different species of invertebrates, fishes, and plants. The Santa Fe River which is located on the Cochiti Reservation has been my field office for the summer. My fellow interns and I built multiple structures such as Baffles and One Rock Dams. The reason for these structures is to create a healthy living environment for fish and to slow down the stream flow. 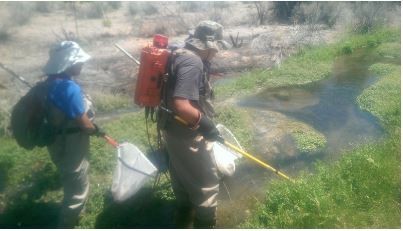 We have also removed invasive fish species to keep native fish population growing and to reintroduce Rio Grande cutthroat trout back into our ancestral domains. I have taken all my field experience from this internship that allow me to become more familiar with this field of study. Also I’ve learned how to conduct myself in a professional setting and what sort of rules and protocol are to be expected. This internship was a very enjoyable experience with US Fish and Wildlife Service and River Source. I learned many of the things I was hoping to over the past two months. This experience made me more inspired to go into this field. Thank you, Cochiti DNRC, US Fish and Wildlife Service, and River Source. Note: The tribal YCC program of the USFWS was instrumental in making this internship possible by paying interns like Destiny for 8 weeks. Thanks! And thanks to the Futures for Children funding and support from McCune Foundation for making it possible for River Source staff to support the cultural ecology & restoration work with Cochiti DNRC and the interns.